In honor of my birthday today, I made myself a raw cheesecake. So the search for the perfect recipe began. The only three criteria I had were 1) chocolate 2) cheesecake and 3) raw. 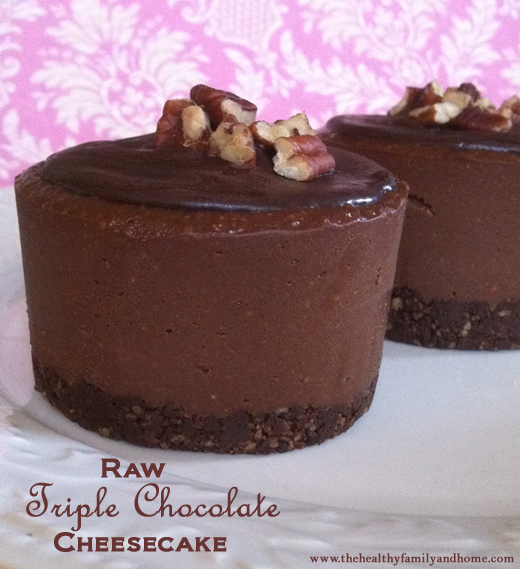 So why did I choose this particular raw chocolate cheesecake recipe from the “Pure2Raw” twins over the dozens I found on the internet? It’s simple….this one is TRIPLE chocolate! It’s three layers of chocolate bliss…chocolate crust, chocolate cheesecake and a chocolate topping. 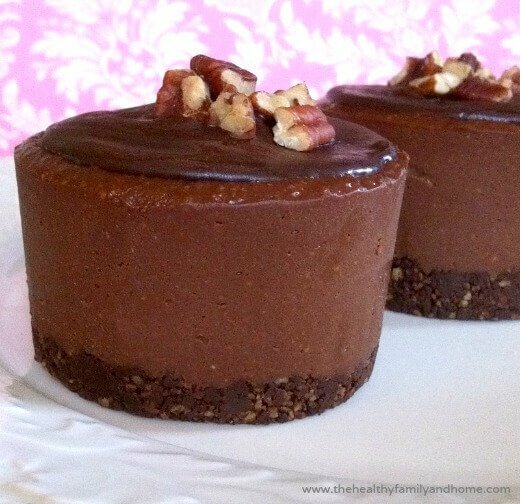 A traditional chocolate cheesecake can be loaded with unhealthy ingredients and empty calories. And don’t forget the 30 minute prep time, and 2 hours and 30 minutes + chill time before you can even eat it. 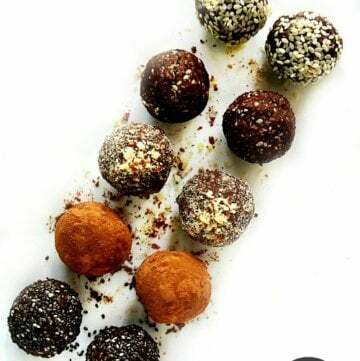 This version has heart-healthy nuts, coconut oil, natural sweeteners and raw cacao… all of which are good for you. Tip #1: You can convert this to a 100% vegan recipe by substituting the sweetener with organic maple syrup or your favorite vegan liquid sweetener. Tip #2: This recipe makes 12 mini cheesecake servings using this mini cheesecake pan. Step 1 Put all ingredients for the crust into a food processor and pulse until well combined and slightly sticky. Scoop crust into your cheesecake pan using approximately 1 tablespoon for each tray and dividing the mixture to fill all 12 trays and press down firmly. Step 2 Put all filling ingredients into a Vitamix or food processor and process until creamy and smooth. Scoop filling into cheesecake pan on top of the crust and divide the mixture to fill all 12 trays. Put in freezer to harden for approximately 1/2 hour or until completely hardened. Step 3 Pull all topping ingredients into a small-medium sized bowl and stir until well combined and creamy. Prior to serving, remove cheesecake from the freezer and pan and gently spread topping on the top. Keep refrigerated or in the freezer until ready to serve because it will get soft and lose it's shape if left out at room temperature. Is it safe to use raw eggs in a cheesecake? 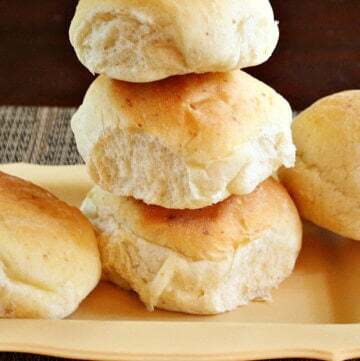 I have a recipe I’ve used for years with eggs and we have always loved it but a friend said it was asking for trouble? Hi there Julie! I, personally, would not use or advise the use of raw eggs in a cheesecake, but the good news is…with this recipe, you don’t need eggs at all! This is a “raw” and “vegan” version of traditional cheesecake that normally uses eggs, but you don’t need them at all in this recipe. The coconut oil is what is going to “hold” the cheesecake together and make it firm and the cashews will give it the thick/dense consistency of a regular cheesecake. So I would save using the eggs (baked) in the traditional cheesecake recipes and just make this one without the eggs. 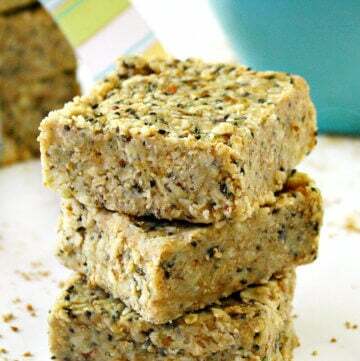 You might be surprised that you like the raw and vegan version better! Could I just make this in a normal cheesecake pan and not as individual cheesecakes? It looks like a wonderful recipe, but I don’t have any separate cheesecake tins. Maybe do it in a cupcake pan? Hi there Madi! Yes, you can make it in a regular cheesecake pan. I would try a smaller pan, like a 6 inch so they would be thick slices. 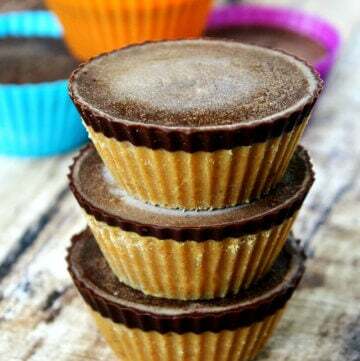 You could also use regular paper or silicone cupcake muffin liners to make individual cheesecakes. Made these today. OMG these are amazing. The only thing I changed was for the crust I used cashews instead of pecans. Hi there Mr Monte! I’m so glad to hear you enjoyed the recipe and great idea for the cashew substitution! Hi there Becky! 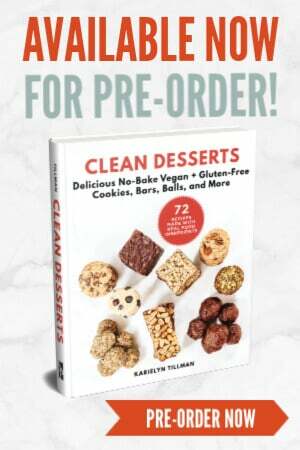 Yes, I would say the majority of my dessert recipes are chocolate so I guess I am a certified chocolate lover lol! You can’t go wrong with this one either because it’s “triple” chocolate. Hi there Becky! Yes, you can definitely substitute the dates with another sweetener. In fact, I alternate sweeteners when I make my cheesecake crusts. You can use your favorite liquid sweetener like maple syrup, coconut nectar or even raw honey. For your friend, I would suggest the raw coconut nectar as it is diabetic friendly and low-glycemic. The dates are used as a sweetener in the crust but the main ingredient that “holds” everything together is the coconut oil. 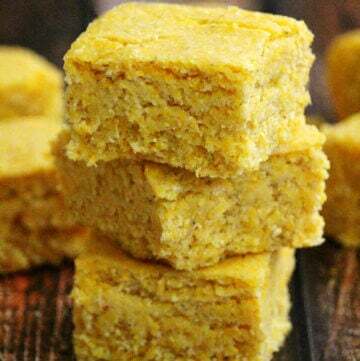 After you process all the crust ingredients in the food processor, they will have a “wet/moist” consistency and it will not appear that it will hold up as a crust. But after you put it in the freezer to harden, the coconut oil solidifies and it will bind everything together. Hi Maybel! I’m so glad you enjoyed it! Yes, I agree with you completely…the twins are super amazing and so are their recipes. 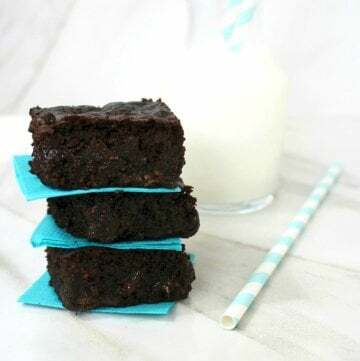 And yes, I did get this recipe originally from them but if you would notice at the end of the recipe in my post, I clearly showed the link to their website and their original recipe, which is what I always do when I make something or am inspired by someone else’s recipe. You must have missed that. 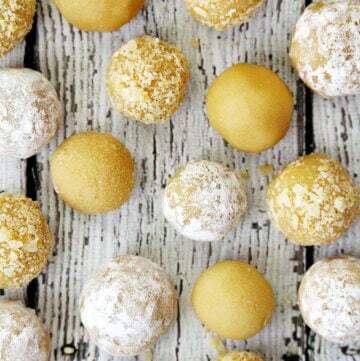 Can’t wait to try your yummy and lusciious looking healthful treats! 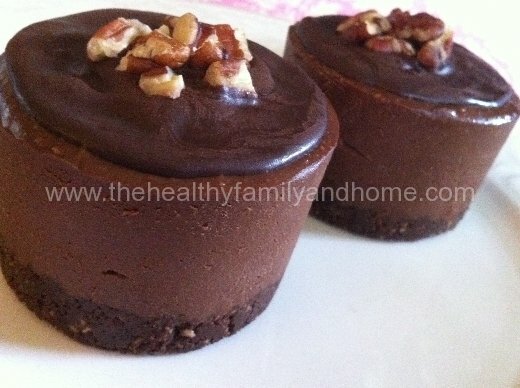 I’m wondering if u can suggest a different type of nut that would work well in the triple chocolate cheesecakes as my 3 year old is allergic to cashews (as well as pistachios). All other nuts are ok, though. Hi Sara! Thanks so much! I haven’t tried this, but maybe macadamia nuts might work? I have another raw cheesecake posted that uses 1 cup cashews and 1 cup of zucchini. I know the zucchini sounds sketchy, but you will never taste it and it makes it creamy. Maybe use 1 cup of macadamia instead of the cashews and 1 cup of zucchini. I just stumbled across your website and everything looks so good. 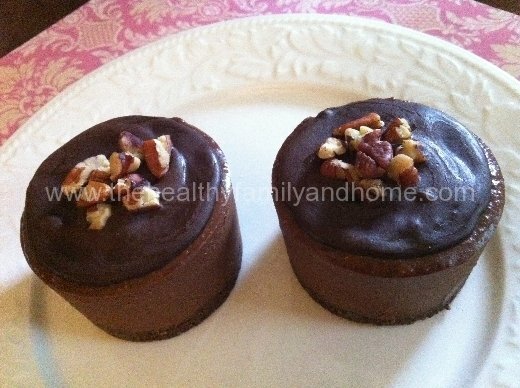 I was just wondering what dishes you used in the triple chocolate cheesecake recipe to get them in individual servings. Hi Lucia! Thank you so much! 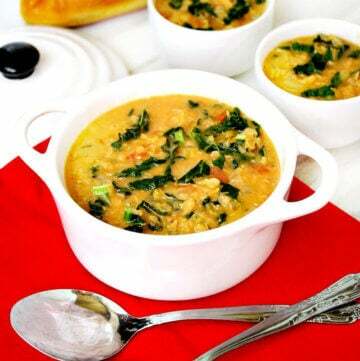 I came across your website and these recipes and photos look amazing!! !